The Collada exporter exports your Mesh character or mesh attachment to a form that is recognizable by the target System (SL, OpenSim or any compatible online world). 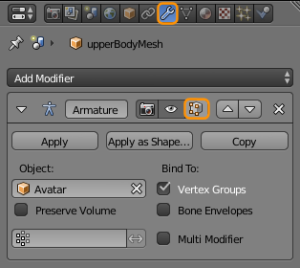 You find the Mesh Exporter in the Blender Export menu.The Exporter opens with a file selection window where you can select the file to where you want to export, or you can type in a new filename. Note: If you prefer to see the Collada exporter in the Tool Shelf, then you can customize the Avastar Add-on Preferences. Hint: You usually can keep the default settings and just click on the “Collada(Avastar)(.dae)” button in the upper right corner of the Window (see zoom icon in this chapter title). The Exporter provides a couple of export options for special cases. Please use these options with care. The View settings get applied by default. These settings are very closely related to the Blender Render System. In most cases you can actually just use the defaults. We will get back to this when we talk about how to use (or not use) Modifiers. Armature Modifiers define the relation between your meshes and your Skeleton (Armature). Armature Modifiers are never applied when exporting because then the mesh wouldd be treated as static non rigged Mesh. This is almost never what you want. For the curious: You find the Armature modifier in the Modifier Stack (see image). Remind: Armature modifiers are always defined in the mesh modifier stack. Armatures them self have no Armature modifier. We will get to armature Modifiers in the “Create an Attachment” tutorial. You can export images along with your models. In that case the exporter stores images as files and adds a reference to the main Collada file. The SL Importer knows how to read and import these images for static meshes. Note: But for rigged meshes the images are not recognized. UV Textures & Material Textures: Blender supports Material based textures and UV textures (which are directly assigned to polygons). Normally you want to export only the UV textures. In rare cases it is more desirable to export the material based textures instead. But beware, Blender does not export the render results, but only the source images! Image Type: The image format is typically predefined in the Blender Render settings. However we found it convenient to offer an immediate setting in the Exporter. By default the image type ONLY applies to generated images. Use ‘Image format’ for all images: If you set this option, then Blender uses the selected image format for all exported images. If you disable the option, then the set image type only applies to the generated images. Use RGBA: Blender can export the Alpha channel for images. Normally you can specify to use either RGB or RGBA for image exports. You do this in the render settings. If the selected export format supports Alpha then enabling RGBA here will export images with Alpha channel even if you have set the render settings to RGB and Vice versa. Hint: You may want to NOT use RGBA because of the Alpha glitch. However this is not a general advice. There are many situations where using Alpha images is even recommended (such as when you want to create an Alpha mask). Hint: If the format of the exported image(es) does not support an Alpha channel then the “Use RGBA” option is simply ignored. Apply Armature Scale: If you have scaled your Armature in Object Mode for making a tiny or a giant you should not apply the scale to the armature because then the entire Avastar Animation system may no longer work. But the Object Scale must be applied when you export the mesh. Otherwise your target online world does not recognize the scale and the giant shrinks back (or the tiny grows back) to normal size. The apply Armature Scale option ensures that the exporter applies scaling to the armature before export. Apply Rotation & Scale: If you have Scaled or rotated your Objects in Object Mode then this Scale&Rotation should be applied to all objects of an export to avoid unexpected scaling and rotation issues within the target system. However this is all so often simply forgotten and sometimes even unknown. Hence we have added an automatic apply Rotation&Scale to the exporter. This setting does not affect the original objects. Weld Edge Normals: When two separate objects share a boundary line, then you typically see a boundary seam in the object texture. This happens because the vertex normals differ even if the adjacent objects share the same vertex locations. This option enforces the exporter to recalculate the vertex normals at the adjacent boundaries of the selected objects. Weld to all visible: Sometimes you want to only export one part but still want the vertex normals be fixed. This option lets the exporter take all visible objects into account when calculating the vertex normals at object boundaries. Export with Joints: When you have edited the Armature to adjust the Rig to your special character (Alien, creature, pet…) then you normally want to keep your edited Armature when you export your Meshes. Hint: You want this option disabled only when your rig is so complex that Avastar can not calculate the Neutral Rig for your situation. In that case please set the sliders to SL Neutral and never touch the sliders again. Disabled: Export the Rig visually as it is. Note: You must make sure that the Appearance Sliders are reset to the SL Neutral Shape (White Stickman Icon). Otherwise Avastar rejects the exports. Enabled: Calculate the neutral skeleton from the current rig settings (temporary set Sliders to Neutral SL Settings) but apply the current Slider settings as bind pose. Pleased refer to the Bond Pose document for further explanations. Hint: You want to enable this option in most cases. Include Parent Hierarchy: Ensure that the exporter includes all parent bones of exported bones as well, even if they have no weights defined. Details: When you enable the above bone filters then it can happen that the exporter does not export all bones of a bone chain. This becomes a problem when one or more of the not exported bones have Joint edits defined. Those definitions would then get lost during export. Enabled: Take care that all parent bones of exported Bones are also exported. Export Bone Roll: Export Bone Roll using the Blender Collada Scheme. Hint: This is only useful when you want to later import back the Dae file to Blender. Export Bone layers: Export Bone Layer Data using the Blender Collada Scheme. Export with SL Rotation: When you export an Avastar Rig then you must make sure that it is rotated according to the SL Standards (so that the character looks into the positive X direction). Hint: You want to enable this option when you export to Second Life or similar worlds. Accept Attachment Weights: SL does not allow weighting of attachment points. Hence we suppress the export of weights for attachment points by default. This option should indeed never be used for SL! Handle with Care. It is very likely that the SL Mesh importer will reject the import of meshes with attachment point weighting sometime in the future. Avastar also provides some advanced export options. However those options are not shown by default as they are only rarely used. Limit Weight Count: In SL the number of weights per vertex is strictly limited to 4. We believe this number is enough for all weighting tasks. In cases where you find this limit too low we always found the real problem was due to bad mesh topology and bad rigging. Setting this number affects the largest number of weights which the Avastar exporter will accept before capping. We strongly recommend to keep this number set to 4. Include Deformer Shape: Some virtual worlds support the Mesh deformer which was originally developed for usage in Second Life.